The DICOM standard was developed in order to satisfy the needs of the users and manufacturer of medical imaging equipments in order to achieve compatibility among acquisition, visualization, processing, description, storage and communication of medical images. The DICOM standard creates the premises to implement local or distributed medical informatics systems; it can be used independently or included in "Hospital Information Systems" (HIS). The DICOM standard is widely spread in USA and was adopted by EU as MEDICOM. In Romania there are many valuable researches in the field of medical imaging, but no one fulfills the DICOM standard. Therefore, the development of an infrastructure and applications compatible with the DICOM standard was compulsory. • Development, implementation and testing in hospital environment of an application for medical image acquisition processing, storing and retrieval in hospital environment, compliant with the DICOM standard. For the distributed system a client-server architecture was chosen composed by a data base server, an image and application server and a DICOM client. A library containing communication procedures and services was developed, based on the existing CTN (Central Test Node) library, which implements the DICOM communication protocol. The library was extended in order to support the transfer of the compressed JPEG and DCOM coded images. The archiving system was designed using a relational data base model implemented in MS SQL. The data bases were structured in 2 categories: control and image storage. A new content-based representation method for medical images was designed by tacking into account the physician's way of taught with application in echocardiography. First the features with diagnostic values were specified then a method for describing the echocardiographic images was implemented. The structured reporting module was designed corresponding to the specifications from the "Content Mapping Resource" section of DICOM standard, which defines the structure of the DICOM medical reports and their composing elements: coded concepts, context groups and templates. The system has a client - server architecture that consists of multiple distributed servers and clients with functions for image processing and report editing. The communication between these components is realized using the DICOM protocol. The archiving system contains servers for images and reports. They implement the DICOM services for storage, query and retrieval (C-STORE, C-FIND, C-GET). The application server intermediates the communication between the above servers and the database server that realizes the storage service. The security of the communication is other service supported by the application server. The integrated environment has modules for domain structuring, report editing, and image processing. This module implements functions for image acquisition from various modalities, for conversion of images to and from different formats, and for processing of single and multi-frame images. The main use of this module is the enhancement of the quality of images in order to ease the extraction of the parameters that have to be reported. The tasks related to reports - editing, management, rendering and communication - are supported by this module and the associated servers. In fig. 2 is sown an example of an echocardiographic report. This module contains a set of tools used to manage DICOM primitives for structured reporting - coded concepts, context groups and templates - stored in corresponding databases. The main purpose of the module is to realize the independence of continuous standard modifications and to enable specialists with powerful tools for extending the standard. Ontology Editor is the application that works with our SNOMED CT-like ontology and has text, language, position and code retrieval capabilities. Contexts & Templates Editor is the other tool in this module and it manages context groups and templates, elements that define the structure and the content of medical reports. The underlining characteristic of these end-applications is their user-friendliness. Fig. 2. 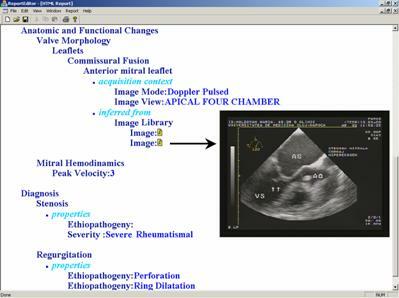 Example of a structured echocardiographic report. System was deployed at a university hospital (over 70 TEE and TTE image series were introduced). Even the structuring methodology was applied and tested for echocardiography, it can be extended to other medical domains. As future developments we intend to extend the image-processing module with functions for automated extraction of parameters and the reporting module with a diagnosis inference mechanism. S. Nedevschi, F. Rusu, I. Popa, A. Smeu, D. Olinic, C. Homorodean - Structured Reporting of Echocardiography Images in a DICOM Environment, IEEE International Conference on Computers in Cardiology, 19-21 Sept., 2004, Chicago, USA. S. Nedevschi, D. Olinic, R. Popovici, F. Rusu , A. Smeu, C. Homorodean "DICOM Compliant Environment for Structured Reporting in Echocardiography", IEEE International Conference on Computers in Cardiology, Thessaloniki, September 21-24, 2003, pp.24-27. S. Nedevschi, R. Teodorescu, Z. Gy ngyi, S. Nedevschi jr., A. Leuca, D. Olinic, Integrated Medical Imaging Environment, A&QT-R 2002 (THETA 13), 2002 IEEE-TTTC International Conference on Automation, Quality and Testing, Robotics, May 23 - 25, 2002, Cluj-Napoca, Romania, pp118-123. S. Nedevschi, D. Olinic, Z. Gyongyi, S. Nedevschi jr., R. Teodorescu, "Feature Based Retrieval of Echocardiographic Images Using DICOM Structured Reporting", IEEE International Conference on Computers in Cardiology, Rotterdam, 23-26 Sept. 2001, pp. 679-682. S. Nedevschi, I. Salomie, Z. Gyongyi, S. Nedevschi jr., R. Teodorescu, D. Olinic "Retrieval of DICOM Ultrasound Images Based on Structured Medical Description", ICETA, Kosice, October 17-19, 2001, pp.181-186. S. Nedevschi, D. Olinic, Z. Gal, A. Leuca, C. Frentiu, A. Becea, N. Olinic, "Retrieval of DICOM echocardiographic images using the diagnosis and biological structures features as search keywords", Proceedings of IEEE International Conference on Computers in Cardiology, Cambridge, USA, 2000, Vol. 27, pp. 283-286. © 2019 Technical University of Cluj-Napoca. Computer Science Department.